Learn how to kick up into a strong and stable pincha mayurasana, otherwise known as peacock tailfeather pose or forearm stand. 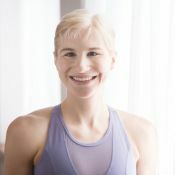 Follow Kat’s quick and easy tips so that what seems like a scary asana becomes a cool, doable pose. Whew!